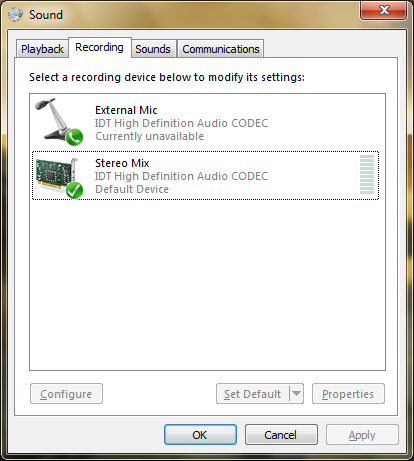 The screencast with audio feature has been tested and works on Windows 7. It may also work on Windows 8 Pro with the Microsoft media pack installed. it will not work on vanilla Windows 8 because Microsoft removed the mpeg2 encoder from vanilla installations (actually is IS there but it is not licensed). On this dialog make sure that you right click in a blank area and select 'Show Disabled Devices' and 'Show Disconnected Devices'. Hopefully you will see an option that looks like it will capture the audio that is playing. If it is disabled, press the properties button and select 'use This Device' from the 'Device Usage' selection. If you don't have anything that can capture audio as it plays then you can select Line-In or Microphone. To get those to work you will have to use a patch cable to plug your 'Speaker Output' or 'Line-Out' into your 'Line-in' or 'Mic-in'. NOTE: The only way to properly connect 'Line-Out' or 'Speaker-Out' into 'Line-In' to your 'Mic-in' is to use an attenuator, the voltage levels of the output are MUCH higher than the Microphone input and will damage you audio hardware if you connect them directly! YOU HAVE BEEN WARNED! Once you have determined which audio input to use, go to the TVShare Advanced menu and select the audio input as your audio device, then press the 'Save' button. After that, just go to your DirecTV menu and select 'Screencast Audio+Video'. While watching your screencast be aware that if you mute or turn down the volume of your speaker output then the audio on the screencast will also be muted or turned down. If you have your TVShare Server in the same room as your TV this may be annoying as the audio on the TV lags behind the audio on the server due to buffering, to fix this you can either use speakers with an external volume control on your server or simply plug a set of headphones into the speaker/headphone output on your TVShare server. *Windows is a registered trademark of the Microsoft Corporation.